Enter a world of Renaissance art and intrigue on a 3-hour tour of the Vatican Museums, Sistine Chapel, and St. Peter’s Basilica. Using a skip-the-line ticket, you’ll avoid the long general entrance line to discover the art and architecture straight away. 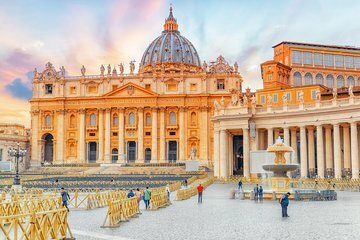 See works by Michelangelo, Raphael, and Leonardo da Vinci; gaze at the Vatican Gardens; admire the artwork of the Sistine Chapel and St. Peter’s Basilica; and visit the papal crypt. Choose from one of several start times, then head to Via dei Gracchi near Vatican City. After meeting your guide, you’ll bypass the main entrance line with your skip-the-line ticket, and enter via an eye-catching spiral staircase. Start exploring the collections of the Vatican Museums, hearing the history that dates back to the 16th-century days of Pope Giulio II. Subsequent popes added to the museums’ collection, amassing an impressive portfolio of art that weaves some 4.35 miles (7km) around the complex. Discover masterpieces of Greek Classical art and Renaissance wonders by the likes of Michelangelo and Raphael. Highlights include the ancient statue of Laocoön and His Sons, and the Transfiguration, Raphael’s last painting. Wander amid the works of Italian masters such as Leonardo da Vinci, Perugino, and Fra Angelico, then pause to admire the Vatican Gardens. Along your way, you’ll hear little-known tales about the Catholic church, and the rivalries between the Renaissance greats. Finish your tour of the Vatican Museums with a visit to the Sistine Chapel, home of Michelangelo’s The Last Judgement, with your guide. Afterward, spend free time inside St. Peter’s Basilica to gaze at La Pietà amid ornate baroque and Renaissance architecture. Before you leave, you can also visit the papal crypt, where Pope John Paul II and others were laid to rest. Dis-organised - lots of hanging around before going in to the Vatican and once inside less time to look at things you wanted to see didn't even get to go in to the museum. Oversubscribed - too many people to herd around making it a bun-fight at check in and difficult to hear the guide during the tour even with headphones on once inside you are often out of range due to the size of the group. we got to see most of what we wanted - but the guide seemed rushed, and we could not understand what was being said some of the time. The group was 41 people when it was advertised as maximum of 20. From the moment I arrived at the tour office it was disorganised and very unprofessional. The guide was very disorganised and hard to hear. She was also disrespectful when we entered the Sistine Chapel by talking when the signs clearly stated that no talking was permitted. She was continually told by security guards to adhere to the non-talking but ignored them and hence was asked to leave. We had group members leave throughout the tour. I'd had a walking tour the day earlier with Walks of Italy and it was fabulous!! The only reason I didn't go with them again was that I had left it too late to book and they were full. I was very disappointed and would not recommend it to anyone. Go with Walks of Italy if you want a tour that is professional and fabulous! This was horrible. Skip the line is an outright lie. We were in a very long line, twice. Our tour guide was very knowledgeable but the waiting around was not what was expected, especially when you sign up for a small group tour that reports to skip the line. Would not recommend this at all. Amazing! The Sistene Chappell was a place of total control with the guards posted inside and outside, completely quite and full respect of the Chappell. The lines were very long, get the skip the line tours, worth every penny. The paintings were breath taking. Our tour guide was nice. However, she kept repeating herself frequently, about nonsense. Didn't add to the experience. She had us standing outside looking at a map of the sistine chapel that she laid down on the ground. ugh. The plus is that we didn't have to wait in line. BOOK a tour! Don't waste valuable time waiting in lines that can take you up to 3 hours to get in. The tours take you in a separate entrance and you go straight in and start your tour. Totally worth it! We had Irina as our tour guide. She was very informative and was even tastefully humorous. There is a fantastic little restaurant just to the left of the entrance with free wifi while you wait. We got there early and they put us on an earlier tour. We really appreciated the flexibility. I would recommend this to anyone. The group was much, much too big. There was no guided tour with of the Sistine chapel or St. Paul's. It was far too expensive for such a substandard tour. We were expecting a lot more information to be shared. There was little or no explanations of art work etc. I felt we had been cheated out of our money by false advertising.